India, being a land of agriculture, has formed scaffolding for many agro-based industries. Around 58.45% of the Indian population mainly depends on agriculture for their livelihood. India is the second biggest rice producing country,  and rice mill industry is the oldest and largest agro-based industry. Morbidity is common among the rice mill workers and their health is at risk. This made us to focus on the morbidity pattern and the working condition among the workers in an industry (rice mill). The study was conducted in three rice mills in our field practicing area (Tumkur). Purposive sampling of 75 workers working of three mills was done in our study. Among them, 35 were coolies, 12 were operators, 15 were weighers, 10 were helpers and 3 were clerks. The study was conducted in the month of October 2007. It was a cross-sectional study. A pre-structured questionnaire was used to collect the information about demographic profile, and environmental conditions of the working place, including health profile of the workers, by interview method. After detailed history taking, general physical examination was done of skin, eye, respiratory system and subjective assessment was done about musculoskeletal system. In respiratory system, chest expansion measurement and peak expiratory flow rate (PEFR) were recorded and detailed history of allergic rhinitis, cold, cough, tightness in the chest, difficulty in breathing, periodic cough and phlegm, and smoking habits was elicited. Skin was examined for contact dermatitis and any allergic reactions, eyes were examined for allergic conditions, and enquiry about musculoskeletal system included low backache and joint pain. Chi-square test was applied to study the relationship between duration (years) of working and their morbid conditions. The present study comprised 75 workers working in three rice mills in our field practicing area. [Table 1] shows the distribution of workers according to their age and gender. Among them, majority of the workers were in the age group of 25-35 years (43%). The mean age of the workers was 25 years and SD was 5.1. Males formed 80% and females formed 20%. Also, 46.66% of them were coolies and were from lower socio economic status. 16% were machine operators, 20% were weighers from lower middle class, 13.33% were helpers from lower middle class and the remaining 4% were clerks were from upper middle class. 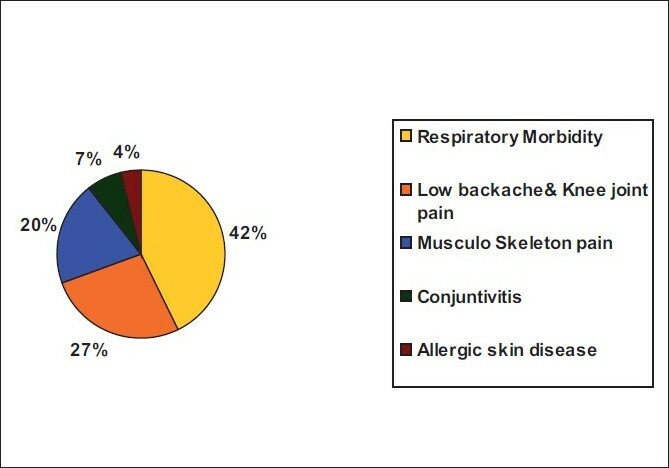 [Figure 1] shows that among the 75 workers, morbid conditions commonly affected respiratory system in 32 (42.66%), 15 (20%) had musculoskeletal pain, 12 (16%) had low backache, 8 (10.66%) had knee pain, 5 had (6.66%) conjunctivitis, followed by 3 (4%) with allergic skin diseases. [Table 2] shows PEFR among the workers. It is observed that among the 75 workers, 8 had PEFR less than 200 l/min. Among them, five were coolies and three were helpers, and these workers gave history of frequent respiratory problems like cold, cough with sputum (persistent cough with productive sputum for 2 successive years - chronic bronchitis). Forty-two (53.33%) of the 75 workers had PEFR measuring between 300 and 350 l/min, followed by 13 workers having PEFR between 350 and 400 l/min and only 2 had more than 450 l/min PEFR. [Table 3] shows the relationship between the duration (years) of the work and the respiratory morbidity. Chi square (χ2 ) was applied to see the relationship between the duration of the work and respiratory morbidity and the association was found to be significant at 5% level of significance (LOS), d.f. 2, as the χ2 value calculated was 8.99, which was more than the χ2 table value of 5.99 at 5% LOS, d.f. 2. Working place was provided with adequate lighting, ventilation and floor space area, but with inadequate toilet and eating area for the workers. The study revealed that prevalence of respiratory morbidity [32 (42.66%)] was significantly higher among the workers and the prevalence of chronic bronchitis could be attributed to occupational exposure to dust and smoking habits among the rice mill workers and also the duration (years) of working. Other important morbidities included low backache and knee joint pain, which was found in around 20 (26.66%) workers, followed by musculoskeletal pain in 15 (20%), conjunctivitis and allergic skin diseases. These findings are in agreement with those of the study by Meo et al.,  in which a significant reduction of forced expiratory volume in 1 second (FEV 1 ), forced vital capacity (FVC), peak expiratory flow (PEF) and maximal voluntary ventilation (MVV) was found among the workers who worked more than 5-8 years, and similarly, the study of Musa et al.,  which showed significant decrease in FEV 1 and FVC among the workers who worked for more than 11 years. Ye et al. showed that rice granary workers had lower mean FEV/FVC values both pre and post shift, which showed that there was an association between chronic grain-dust exposure and chronic airway obstruction. Bhat et al. 's  study showed that there was comparative decrease in PEFR/min within 1 year after the workers joined the job. Pradhan et al.,  in their study, found that 59% suffered from knee joint pain and 61.5% suffered from low back and knee joint pain. Karim et al. studied the prevalence of allergy and conjunctivitis, which revealed allergic symptoms in 17% and conjunctivitis in 19%. The important morbidities detected among the rice mill workers were chronic bronchitis, allergic bronchitis, low backache and knee joint pain. Even with adequate ventilation and lighting at the working place, the respiratory morbidity was quite significant among these workers, which might be attributed to occupational exposure to dust among the workers. These findings are in agreement with those of other studies conducted on these workers. Based on the findings, we recommend the following. Further studies with large sample size. The use of protective devices such as respiratory masks and goggles by these workers should be promoted in order to reduce the occupational exposure to dust. Occupational health services should be provided to these workers, which include pre-placement examination, routine health check-ups, health education and rationalization of the work methods so as to improve the health and safety of the workers. 1. Nayak P. Problems and Prospects of Rice mill Modernization: A case study. J Assam University 1996;1:22-8. 2. National Portal Content Management team, GOI. 4. Meo SA. Dose response of Years of exposure on lung functions in the Flour mill workers. J Occup Health 2004;46:187-91. 5. Musa R, Naing L, Ahmad Z, Kamarul Y. Respiratory Health of rice millers in Kelantan, Malaysia. Southeast Asian J Trop Med and Public Health 2000;31:3. 6. Ye TT, Huang JX, Shen YE, Lu PL, Christiani DC. Respiratory symptoms and pulmonary functions among Chinese rice granary workers. Int J Occup Environ Health 1998;4:155-9. 7. Bhat MR, Rangaswamy C. A comparative study of lung functions in rice mill and saw mill workers. Indian J Physiol Pharmacol 1991;35:27-30. 8. Pradhan CK, Thakur S, Chowdhury AR. Physiology and subjective assessment of food grain handling workers in west Godavari district, India. Ind Health 2007;45:165-9.